Took a swim with a big fish in the Cincinnati social media pond recently. In a free Webinar, Steve Phillips of Purple Trout shared some tips for getting your Web site, blog and social media (Twitter, Facebook, LinkedIn, etc.) at the top of search engine results. Steve said to keep in mind that people search by word, topic, event and product/service. He then filled an hour with lots of good information. Here are some highlights from my notes and Twitter stream. • Tag pdf files: Put keywords in them, using Properties. (I tried this. It’s simple to do). You can tag videos and pictures like this, too, through Properties. • Look up XML Site Maps with Google. (Google it.) Helps Google crawl entire Web site. • Use Google Keyword Research Tool to find popular keywords. • Ask as if each Web page is its own Web site. Should have own title and description to optimize. • Important to put keywords in pay-for-click campaign ads to optimize for Google searches. Also landing page. • Tag everything on your Web site — videos, pictures, PDF files, flash. • Keywords placed strategically within Web site help with search engine optimization. • It’s all about content and keywords. Tag posts. • Put your blog’s URL in Google, Yahoo!, Bing. See if being crawled. Do link-building: Feedburner, Technorati (Submit to Technorati), comment on blogs. • Put keyword in headline and post entry. Put headline in Google and search for results. • Don’t just say “I agree” when commenting on other blogs. Contribute to the conversation. • Facebook has real-time indexing. Keep “posts by everyone” in mind Use keywords when doing status updates. • Use all tabs (links, photos, video, events boxes…). • Ask questions to engage participants. • Optimize Twitter: Use keywords in Tweets – company name as much as possible. Include helpful links. Use company name, products, services. But be helpful. • Participate in Answers section. Can search keywords for questions in your industry. Be helpful. Answer Q’s. • To improve search results, have profile 100% complete. Use targeted keywords in headline. Hope this wasn’t overly technical. Not sure I understand everything! Thanks to Steve for sharing this good information. It was nice swimming in his pond. Ustream and Facebook and LinkedIn, Oh My! 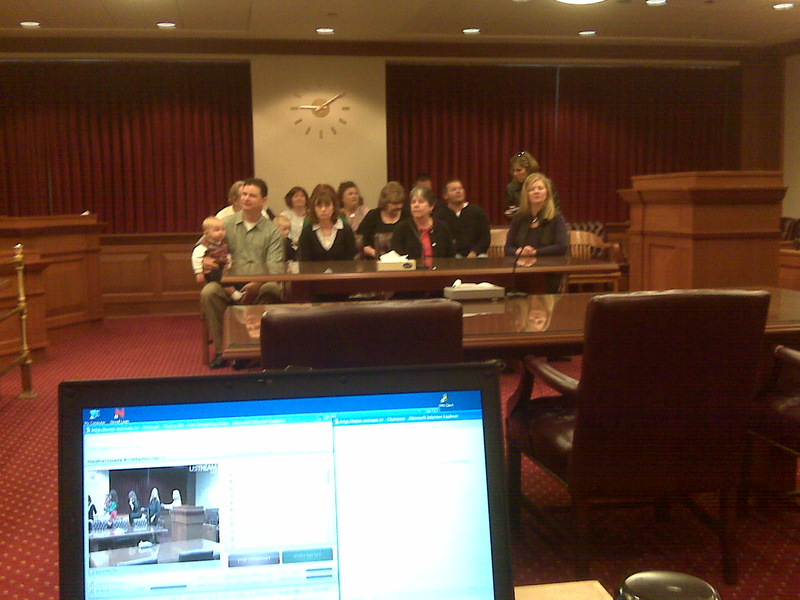 Streaming video from adoption ceremony helped build awareness about important issue. Imagine if Dorothy and the gang would have had social media. Instead of lions and tigers and bears, it might have been Ustream and Facebook and LinkedIn. Oh, my! Here are some of my recent experiences while skipping down the yellow brick road of social media. Yesterday morning, my Communications teammates at the Hamilton County Department of Job and Family Services and I streamed live video from the third-annual “mass adoption” ceremony in Probate Court. Five families adopted children from the child protection system in a moving event held to build awareness about the need for adoptive parents. Although my employer recruits more than 100 adoptive families each year, the need never goes away. About 200 kids — mostly school-aged youngsters in sibling sets — await adoptive families as this is being written. I’ve really appreciated watching live streams from Cincinnati Social Media, New Media Cincinnati and other events — on those occasions when I can’t attend. I’ve brought up the idea of us streaming from happenings such as the mass adoption to get more value out of them. My boss, Brian Gregg, thought this was a good idea. Penny Hedrick, a video expert, set to work on the AV end. And John Cummings of Foster Care and Adoption Recruitment, a former radio guy, got ready to do on-air talent work. Meanwhile, Communications teammate Laura Van Houten and administrative assistant Kathy Pflum agreed to monitor the online stream back at the office. I served as laptop techie, working Ustream, Twitter and Facebook. Well, it was an adventure, to say the least. Kevin Dugan, Mr. Social Media in Cincinnati, warned me at the most-recent PRSA meeting to test the AV. I know from watching that Ustream almost always blips off during a stream. We had tested the laptop, wireless card, camera… in advance. Penny made several trips to the courtroom to do test streams. Still, we encountered technical difficulties — probably indicating we needed a more stout Internet connection and a more beefed-up laptop. Also, more experience by the Ustream operator (which will come in time) would have helped. What happened was that I stopped the stream during “dead air” time. When I hit the “stream” and “record” buttons to restart the broadcast, only “stream” worked. Record was grayed out. Then, after two of the five adoptions had taken place, I clicked on the Facebook tool in Ustream and the stream stopped. Ustream would blip off in a split second every time I hit “stream.” We couldn’t get it to work until John was doing the recap. Despite these glitches, we consider the first-time try worthwhile. About 25 people got a chance to view the first two adoptions. One viewer commented on Twitter that he clapped along with the audience! Another, a former social worker with our agency, offered praise for the fine work our Adoptions staff is doing. Side note: I sent a photo to Twitter using TwitPic on my BlackBerry — and it got more than 50 views. Bottom line: We built awareness about an important issue, even though we were basically doing a test-run. Here’s a little tale about Facebook. Less than three weeks ago, I started a Facebook page for my place of worship — New Thought Unity Center in Cincinnati. I put on a logo, basic information, video clips and photos from services. I invited members of the congregation who also are Facebook friends. Already, we have more than 160 fans! One person, who attended Unity years ago, said the Facebook updates are prompting her to return. Another said it makes her feel great to see a Unity update in her Facebook stream. People are commenting and giving thumbs-up. One point: I’ve had to educate people on our volunteer marketing committee that a Facebook fan page isn’t like a Web site home page. Rarely do people come to a fan page. Instead, people see updates in their Facebook streams. You need to do daily, in my opinion, updates. Space them out — morning, afternoon, evening. Do one at a time. Don’t do six or seven (as one administrator did) at once, or people will hide your posts or unfollow. Finally, as we near a return to Kansas, here’s a note about LinkedIn. I learned about the power of LinkedIn groups recently by posting a link to this blog on PR-related groups. I shared my notes from the PRSA Media Day — the previous two posts. Wow! The posts got 10 times more visits than the average for this blog. A point to make: I shared something that I thought viewers would appreciate and benefit from — not some spam about an unrelated event. Unfortunately, most of the shares I get on LinkedIn discussion and news feeds are from people promoting something unrelated to the group’s mission. Hope you found these experiences helpful. I’m off to see the Wizard, the wonderful Wizard of… social media? Although there’s been considerable focus on “new” media, the “old folks” still play a vital role in our strategic public relations efforts. For example, we generally get a lot more activity in our live online chats at the Hamilton County Department of Job and Family Services when the local newspaper, TV or radio outlets do a blurb or mention as a result of our press releases. Our communications director has established good working relationships with the media, so they know he’ll provide newsworthy material. At the heart of Media Relations is getting to know the needs of individual journalists — and striving to meet them. One might want video, photos and fact sheets. Another might prefer a two-paragraph e-mail. It’s important to learn their preferences and then read, listen to and/or view their reports. Offer story ideas of value to their readers/viewers/listeners. Sewell covers P&G, Kroger and breaking news. Likes brief pitches. E-mail best. Subject line critical. Contact info. Couple lines and bullet points. Whatever helps sell the story to editors. Relevance. Statistics. Trends. AP reporters like Sewell heavily involved in Twitter. Facebook to lesser extent, but evolving quickly. Use to develop contacts, get story ideas, see what people are talking about. Driehaus does not use HARO to get sources. Will use Twitter, Facebook in a pinch. Pitches more stories to NYT than they assign. Likes brief pitches. E-mail best. Forta does a speed cleaning page. Tests products in lab. Does a blog. Drives traffic with Twitter and Facebook. Web work adds to workload. All use bloggers for tips or background. May become a source. Never lift from blogs. Good Housekeeping getting info from Webinars. Started June 1. Had been in Columbus market for 20 years Doesn’t like pdf attachments. Doesn’t want a suit. Wants real people. Hope you find this helpful. Please feel free to share your thoughts about this. Cincinnati PR pros embrace media: old and new. Out with the old. In with the new. Actually, it’s not that simple — especially when you’re considering evolution of news media and its impact on strategic public relations. We’re in such a transitional period. Got a great taste of that evolution at the Cincinnati PRSA Media Day on Oct. 29. • Traditional newspapers will not go away. Format will change. They will adapt. • Power of mobile technology will come more into play. • Apps that will go away are ones that push spam. Will be a move to aggregators. Conversation and connecting. • When talking “media relations,” 99% of PR agencies include blogger relations. • Bloggers love getting exclusives, and/or having special invitations to insider parties at conferences. • FTC is pushing for transparency and truthfulness on blogs. • Bloggers like to get “social media releases” with video, photos, text. Saves them time, so they don’t have to dig up photos, etc. • Bloggers love launch events. Make it a soft sell, an experience with the product. Bloggers love to connect, to get into conversation with their peers. Layer in another reason to attend than the product alone. Example: PBS allowed women bloggers to shoot video with characters while launching a new Web site. Bloggers played with the site while waiting for their turn to do the video. • Send a personal note before you send a press release. • Find people who already like your product and work with them, even if they don’t have the largest audience. More efficient than trying to win over others. • Don’t start a Facebook fan page and just let it sit there. Make it conversational. Share industry trends. Comment back. • Implement Facebook Connect on your Web site. Integrate Twitter, Facebook and other social media platforms throughout your Web site. Create an ecosystem. Make it interactive. • Starting out, blog 3-5 times per week. Roughly 500-750 words. Lists good for companies that blog. Links are important. If you’d like, I’ll share notes from the old-school media in a future post. Let me know in the comments.